CoilyQueens™ : Haircare tips while wearing braids or weaves. Haircare tips while wearing braids or weaves. Because the hair extension lays on top of your natural hair, your hair becomes dried out after a time. Hair extensions are layered in chemicals which dry your natural hair out. Hair being pulled to tightly. You should be able to bend your single braid back and forth without it being painful. When you look at the root of your braid it should not be pulling from the scalp. If you see white bumps form, remove braids immediately. If your extensions are painful to sleep in still one week after receiving the style, then you should remove your hair extensions or wash your hair to loosen the braid extensions. Leaving extensions in hair to long. 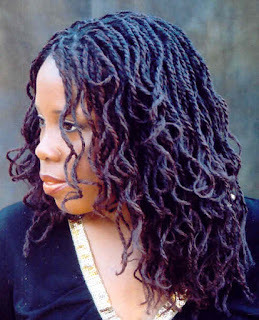 All braids or extension services should be removed after 10 weeks. Your hair was dry and breaking before adding the hair extensions. Although many people do this, it is not recommended to add extensions to damage hair. Also hair should be cleansed and deep conditioned before applying hair extensions. Never braid dry hair. If your hair is having a problem with retaining moisture, correct your moisture retention issues before you get your hair braided or weaved. Strengthen your hair strands with a protein treatment before adding any type of hair extension. Braiding and weaving requires the twisting and manipulation of your hair strands and if those strands are weak this will cause breakage. This is why many will see that while they gain length when their hair is braided or weaved, in many cases their hair is not as thick as it should be. Want to know how to grow your hair longer with braids? Read: Ms. Vee's Braid, Retain and Grow haircare method. Proven results by many! I love you advice. I have to natural hair daughters me included, one is always concerned about her length, the other has not she was born with a different type (just add water for softness and control). One day I bought a new hair dryer which was for Asian hair and it fryed her hair and gave her a harder texture. we would achieve length then breakage a terrible cycle.. Her self esteem has suffered. I never knew really how to handle hair for length, Thank you so much you are an angel and a prayer for millions. Thank you for commenting! First work on keeping her hair moisturized and getting her hair to retain moisture. Let her know the importance of wearing her hair up in protective styles most of the time. And then let her reward herself in wearing it loose maybe one day a week. The easiest way for most teens to grow their hair and still look cute (to them) is to wear hair extensions such as braids. If you decide this is the route for her then please read my article Braid, Retain and Grow and follow the suggested routine. If she does it for one year she will achieve great lengths. Extensions are not the only way to grow your hair though, read over the Regimen builder worksheet all the questions asked are relevant to having a good haircare regimen. Longer stronger hair can be hers. Please let me know if you need more help in the future. Yes, I recommend that you always keep your hair and scalp clean and free of bacteria and dirt. Some weaves are very difficult to wash well, so it largely depends on how the weave was put on the hair. For full sew in weaves I recommend using a scalp cleanser and a toothbrush and slowly and gently go through your scalp cleaning in b/n each weave track, then rinse using a spray nozzle in b/n each track really good. Also easy to rinse your weaves while in the shower it helps to cut down on tangles. After you cleanse your scalp then shampoo any leave out regular as you would if all your hair was loose and also deep condition it. I will make a more detailed article about this, thanks for your question. The truth about Protein and your hair.